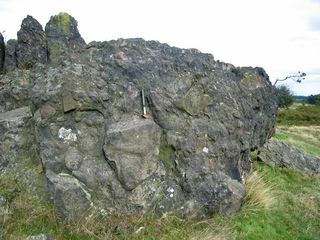 Volcanic breccia of the Charnwood Lodge Volcanic Formation (Maplewell Group, Charnian Supergroup, showing large andesite blocks, at the 'Bomb Rocks' locality, Charnwood Lodge. current 12:32, 6 June 2014 1,000 × 750 (227 KB) Dbk (Talk | contribs) Volcanic breccia of the Charnwood Lodge Volcanic Formation (Maplewell Group, Charnian Supergroup, showing large andesite blocks, at the 'Bomb Rocks' locality, Charnwood Lodge. This page was last modified on 6 June 2014, at 12:32.